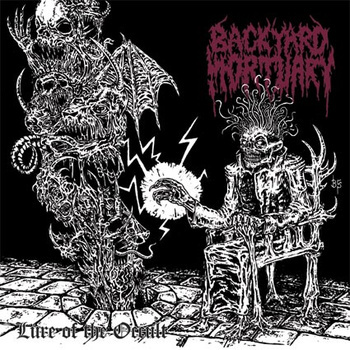 Hailing from Australia, BACKYARD MORTUARY formed in 2002 with the intention of creating rotten Death Metal in the vein of the late 80s/early 90s classics. The demo ‘Dead Goregous’ was recorded and self-released later that year and shortly after the line-up was completed and live shows followed. In 2005 a self-titled EP was recorded and released through Australian label Beer in Your Ear and on cassette through Swedish label Zombie Ritual Tapes (An old sub-label of Blood Harvest Records). A cover of Death’s ‘Mutilation’ was also recorded for a tribute to Chuck Schuldiner compilation, released through Chinese label Area Death Productions. Finally, in early 2011 the album ‘Lure of the Occult’ was recorded and then, after further delays, self-released on CD in 2012. ‘Lure of the Occult’ is easily the heaviest, darkest and most morbid recording by BACKYARD MORTUARY so far, ranging from slow and crushing to fast and neck breaking, with powerful, vomiting vocals and memorable, headbanging riffs. With their live performances BACKYARD MORTUARY has supported bands such as Exhumed, Deeds of Flesh, Gospel of the Horns, Denial of God, Vomitor, Urgrund among many others.